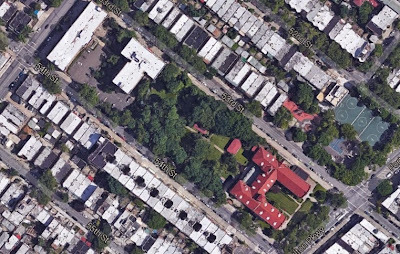 The interior block between 9th & Fort Hamilton Parkway (53rd to 54th) is taken up almost entirely by the Monastery of the Precious Blood. The grand & forbidding monastery buildings take up most of the eastern end of the block, while the western end contains Catholic Charities senior residences. In the middle, a swath of garden, forbidden to outsiders, who can only gaze up above the high brick walls to a grove of trees. Google Earth, however, allows us to flout the rules, hop the wall, and take a peek at the layout. The Sisters Adorers of the Precious Blood, an order founded in 1861 in St. Hyacinthe, Quebec, came to the United States and to Brooklyn in 1890 at the request of Bishop John Loughlin. They first settled on Sumpter Street, in Bushwick. To Begin for the Sisters of the Precious Blood. Their New Convent Will Formally be Opened By Bishop Loughlin To-morrow. A Very Strict Religious Order Now First Established in the United States. The Brooklyn Eagle, April 29, 1890, 6. The Sister Adorers seem to be few in number today. In 2012 they were joined by members of another, more recent cloistered order, the contemplative sisters of the Monastery of St. Edith Stein, who were previously based in Flatlands. You can watch a short video about life in their new home. According to a recent newsletter, the monastery is in urgent need of financial help. Some funds are raised through the sale of needlework, such as liturgical vestments, baptism gowns, and altar cloths, and a retreat house is open for visitors, but more assistance is needed. But even for those who know who lives inside -- the priest who celebrates Mass for the sisters at dawn, the parishioners who bring them fish and fruit and speak with them occasionally -- there has always been almost as great a sense of mystery. Because unlike other cloistered orders, the Brooklyn nuns have remained perhaps America's last practitioners of the oldest way: a life of complete isolation rooted in the 16th century. This means that even those who have visited the whitewashed Italianate monastery for decades have never once seen its inhabitants. No one can say for certain how many nuns live in the cloister, with the guesses ranging from 9 to 17. Even the priest who visits them six mornings a week, Monsignor Guy J. Puglisi, is unsure of their number and has no idea of the range of their ages. "It's a good question, but I can't answer it," he said. They remain hidden to visitors, communicating only through a barrel-shaped revolving wooden cabinet called a turn, first used in the Middle Ages to pass goods into monasteries without violating the cloister. In the few other American cloisters that had them, turns disappeared as part of Vatican reforms in the 1960's. But a year later, with only a handful of nuns remaining, a decision was made to close the monastery, and it was converted to senior housing.